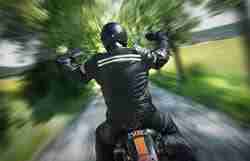 I was riding my motor cycle along a secondary road in Manchester heading towards Altrincham when a car came speeding around the bend ahead clearly travelling over the speed limit. The driver could not control the vehicle and swerved onto my side of the road. Before I had time to react the car clipped my motorbike and I was thrown to the floor sustaining multiple injuries including: a fractured sternum, shattered ribs, a broken shoulder and a sore neck. The police attended at the scene and the car driver might be prosecuted by the Crown Prosecution Service for dangerous driving. I was taken to casualty at a hospital in Salford and was then referred to the casualty unit in Manchester. I have spent in total 5 days in hospital, I am in a lot of pain and receiving medication. Am I likely to win a claim for compensation for my injured in the motor cycle accident and how much compensation am I likely to get? 1. I think that you have a strong claim for RTA compensation for all of the injuries you have described and for the repair to your motorbike, lost income and other expenses you may have incurred. The accident seems quite clearly to be the car driver’s fault and this is borne out by the fact the CPS are likely to prosecute the driver for dangerous driving. 2. At this stage it would be very difficult to say how much the claim for your fractured sternum, shattered ribs, broken shoulder and a sore neck are worth. To establish the value of your claim – an independent medical report from an orthopaedic consultant would be necessary setting out your injuries with a prognosis as to how long you can expect to recover. It is very important that you have a specialist RTA solicitor help you with your claim – the legal costs can be paid by the driver at fault in addition to your compensation.